There will be a good chance for rain Monday and Tuesday. 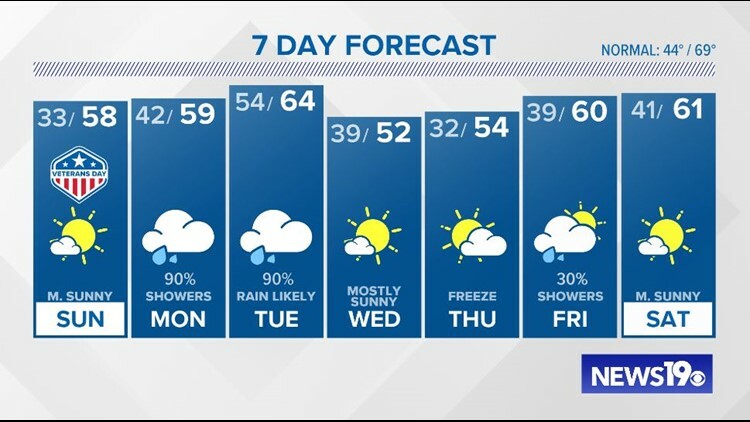 Columbia, SC (WLTX) — It will be mostly sunny and dry Sunday, but the chance for rain returns to the area Monday. Clouds will begin to increase across the Midlands Sunday night in advance of the next weather system. It will be cloudy Monday with rain moving in during the afternoon. Rain will be likely Monday night into Tuesday. A cold front will move through the area bringing an end to the rain and breezy conditions will bring colder weather. A cold air mass will cover the region for the latter half of the workweek. There will be abundant sunshine, but this will be the coldest air of the season. Widespread freezes along with frost are expected by Thursday morning. This will bring an end to the summer growing season. Another weather system may approach the area late in the workweek. Partly cloudy skies are expected Thursday, there may be some showers Friday. Any rain and clouds should be out of the area by Saturday. High temperatures will remain below normal over the next seven days.